Brian McGee, 33, a married father of one, is a plumber and a member of Plumbers Local 1. He is currently working on the Riverside Drive Project in New York City, a 100% union-built property located along the Hudson River on the Upper West Side of Manhattan that is financed by union pension dollars through AFL-CIO-sponsored programs. 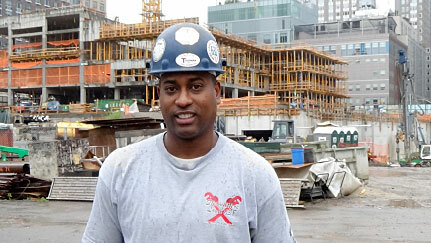 Brian, who has been a part of his union since 2006, is working on all of the plumbing aspects for the Riverside Project. He is currently installing the 12-inch storm mains that will be going through the school on the lower levels of the building. When asked what Brian would say to a young person who is thinking about going into the field of plumbing, he highly recommends it. “Because one, as a plumber you help protect the health of the nation by keeping the waste and treating it, and two, you know that you have a good solid trade and you’ll be able to earn money for you and your family.” Brian loves the brotherhood and camaraderie of being a union member, and it has helped provide a solid financial base for him and for his family.